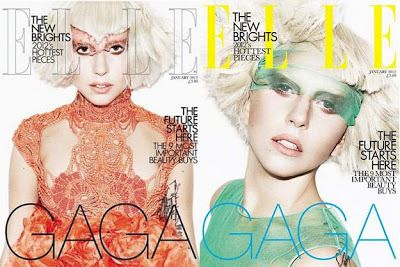 Lady Gaga is featured on the January 2012 cover of the UK edition of Elle magazine – not once, but twice. The pop icon appears in two different fashion styles with outfits designed by Alexander McQueen and Simone Rocha. Elle has released an exclusive behind-the-scenes video from the photo shoot for the issue, which hits UK newsstands this week. Last week, the star released “A Very Gaga Holiday,” a companion EP to her US Thanksgiving special.